The 21-year-old offensive lineman has signed a contract with the Atlanta Falcons. Matt Gono didn’t hear his named called at the NFL Draft, but his path to the pros was never going to be conventional anyway. The 21-year-old offensive lineman didn’t start playing football until he got to Cinnaminson High School, and he played his college ball at Wesley College, a Division III school in Delaware. “It worked out regardless in the end,” he added. That’s because Gono agreed to a free agent deal with the Atlanta Falcons immediately after the draft. He officially signed the contract on April 30. “I was just like, ‘Wow, I never would have imagined,’” Gono said. “It was a great feeling” to sign the contract. Gono, who graduated from Cinnaminson in 2014, has to report to Falcons camp on May 10. He said he plans to immerse himself in the team’s playbook and commit fully to practice and workouts in an effort to make the squad for the start of the season. “When I go there, that’s the only thing I’m going to be thinking about,” he said about making the team. Mike Drass, Wesley’s football coach and athletic director, praised Gono’s work ethic. “The thing that makes Matt special is that he’s extremely athletic for a man his size,” he added. Gono is 6 feet 4 inches tall and 316 pounds. Drass said he arrived at Wesley at around 270 pounds and had to work hard to pack on the extra pounds to develop into a better lineman. “He’s young in football,” Drass added. Many elite football players start playing competitively at the Pop Warner level, but Gono didn’t play the game until a coach noticed his size and approached him about it at Cinnaminson High School. “No one talked about football in my family,” Gono explained. Gono said he wasn’t disappointed when no big-time Division I football coaches recruited him out of high school. 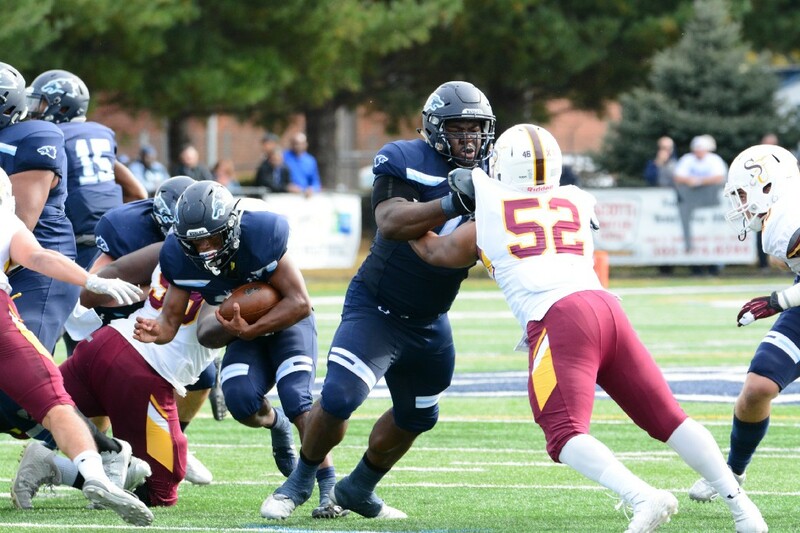 He said he just focused on improving his game at Wesley, where he was named a First Team All-American by the American Football Coaches Association in 2017. “When I got there, I wasn’t concerned whether it was Division II, III or I,” Gono said. 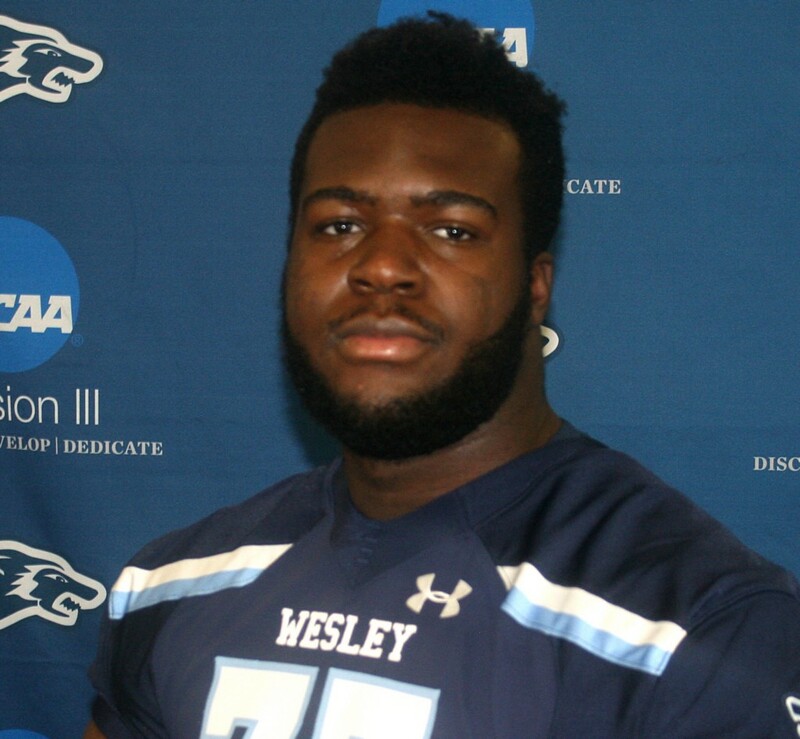 Drass said Gono excelled during his four years at Wesley and became a dominant player along the offensive line. Seventeen NFL scouts showed up for Gono’s Pro Day workout at Wesley. He bench-pressed 225 pounds 26 times and had a 118-inch broad jump, which would have placed him second in his position at the NFL Combine, according to a school news release. “There’s no question he’s a guy, I think, that can translate well to the next level,” Drass said. Gono said he decided to sign with the Falcons after meeting with the team’s coach. The team’s offensive system requires athletic linemen, he said. “It’s a perfect fit for my body type,” Gono said. Gono is studying criminal justice at Wesley, and he will still need to pick up a few credits for his degree after this semester. He said he plans to finish his remaining classes in the offseason. Gono and his family now live in Mt. Laurel, but he said he likes to come back to Cinnaminson High School to see his former coaches, teachers and classmates. “When I come home, if I have the time, I always go to the high school,” he said. If he had the opportunity, Gono would advise high school players to look past the glamor of the NFL and work hard to continue to improve every day. “Do your best, and focus on what’s in front of you,” Gono said.